A bright and homely one bedroom apartment situated in central Puerto del Carmen, located only 200 metres from the beach road in Puerto del Carmen. A small well maintained complex with established gardens is ideal for anyone wanting a relaxing holiday yet only a 2 minute walk to the beach and local amenities. 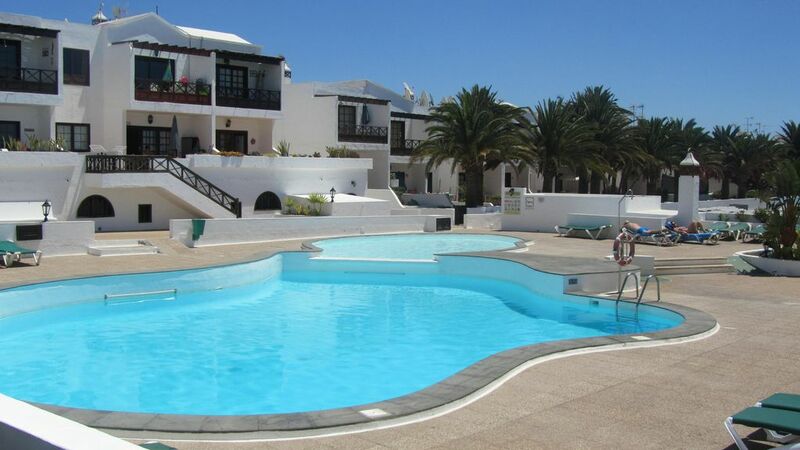 The large swimming pool is cleaned daily the pool terrace is spacious with plenty of sun beds. The area is completely flat so ideal for anyone with walking difficulties, no hills to climb, a good size supermarket is close by along with many bars, restaurants and shops. Modern fully tiled bathroom with large spacious walk in shower, WC, sink unit with mirror and washing machine. Hairdryer is provided. Spacious lounge with sofa, chair, coffee table, dining table, Satellite TV, DVD, Fan. Fully fitted kitchen with electric hob, oven, fridge freezer, microwave, kettle, coffee maker, toaster, well equipped with crockery, cutlery, glasses, cooking utensils, pans, iron and ironing board, breakfast bar. The 18 hole golf course in Puerto del Carmen is only a 5 minute drive away, Lanzarote has a 2nd 18 hole course in Costa Teguise, a 20 minute drive away. Notes on accommodation: The apartment is fully equipped, there is a safe, hairdryer, iron and ironing board. Due to increasing weight restrictions we also provide beach towels. A 24 hour contact number will be given to you in case of any emergencies, we are also Spanish speaking. Outside: The terrace has a table and chairs with cushions and an awning. You can sit and enjoy a meal or drinks on the terrace without being disturbed as it isn't overlooking the pool area. The complex boasts mature established gardens, there is a large pool and a smaller separate child's pool next to it. Cleaning / Towels / Linen / Maid service: The apartment is cleaned and the bedding, towels changed weekly, two sets of towels per person are left on arrival, a washing machine is provided if these need to be laundered during your stay. The main beach in Puerto del Carmen, 'Playa Grande' is only a 5 minute walk from the apartment and the main beach promenade only a 2 minute walk. There are a selection of other beaches in the resort, if you prefer smaller beaches there are several within easy walking distance of the complex. Water sports, parascending and jet skis available at Playa Chica in the old town of Puerto del Carmen. Arrecife airport is only a 10 minute journey by taxi and costs approximately 12-15 euros. Car hire is cheap and can be found within 2 mins of the complex, please advise if you wish to hire a car we can recommend a good car hire company. A large parking area is situated in front of the complex. The apartment is situated in the centre of Puerto del Carmen, you can enjoy a 20 minute walk along the main beach road to reach the old town. Buses to other resorts and island tours are readily available, we can offer advice on island tours and places of interest. During your stay we can offer any information needed on supermarkets, places of interest, gyms, sports facilities, restaurants. We also offer a 24hr emergency contact number.